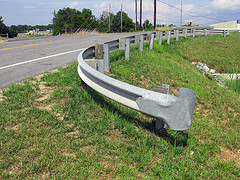 In previous posts, we ha ve discussed significant problems with certain guardrails used on U.S. highways. Now, a government reporting agency is adding its voice to the outcry about dangerous guardrails. As a San Francisco defective roads law firm, we are concerned about this continued problem and a “safety device” that appears to be anything but safe. This week, ABC7 reported that, three years after the news channel first discussed problems with certain guardrails, the General Accounting Office (“GAO”) has come out with a report criticizing regulators for failing to protect Americans from a guardrail system that has been tied to numerous injuries and even death. The GAO is an independent government agency that performs audits and investigations for the U.S. Congress. Its report suggests that the Federal Highway Safety Administration has failed to sufficiently address the problem of defective guardrails and urges the Department of Transportation to improve its oversight of guardrails. The report also criticizes states for being slow to install improved device. Further, the GAO’s brief questions the crash-testing process used in the development of some guardrails and calls for improved testing using third-party verification. ABC7 notes that it brought the problem of dangerous guardrails to the attention of an area Congressman three years ago when multiple lawsuits were alleging issues with an end unit guardrail system known as “ET-Plus.” The lawsuits allege that, instead of slowing a car down by allowing the guardrail to peel away, the unit can lock up causing the guardrail to either pierce the vehicle or allow it to keep moving forward. In an ongoing lawsuit, a guardrail unit is alleged to have contributed to the November 2014 death of area football star Darryl Blackmon whose car flipped upside down after hitting a post on 101 North in Mill Valley. A Caltrans spokesperson told ABC7 that the agency has placed a moratorium on installing ET-Plus end units. However, an inventory conducted in 2014 suggests some 3,600 ET-Plus units remained on California highways. These are only being replaced when crashes, maintenance matters, or other road projects require the change. The Caltrans spokesman denied that the units are unsafe. When a car accident causes death or injury, a careful investigation can often reveal more than one culprit. Far too often, one contributing cause is a dangerous road condition. In May 2009, a group of unions and other parties interested in transportation issues commissioned a study entitled “On a Crash Course: The Dangers and Health Costs of Deficient Roadways.” Conducted by a non-profit organization focused on public health, the study found that road conditions were a contributing factor in 38% of non-fatal motor vehicle crashes and a startling 52.7% of fatal motor vehicle crashes occurring annually in the United States. The report found that found conditions greatly influenced the severity of crashes and were “the single most lethal contributing factor,” beating out alcohol use, speeding, and the failure to use a seatbelt. The Brod Law Firm helps people throughout Northern California who have been injured or lost a loved one because of a defective guardrail or other dangerous road condition. These lawsuits often involve filing suit against a government agency and require a firm like ours that understands the complicated procedures for such claims. Call our dangerous roads law firm in San Francisco, Santa Rosa, or Oakland to learn more.